Soon it’ll be time to decorate the Christmas tree! There are so many ways you could choose to decorate it. 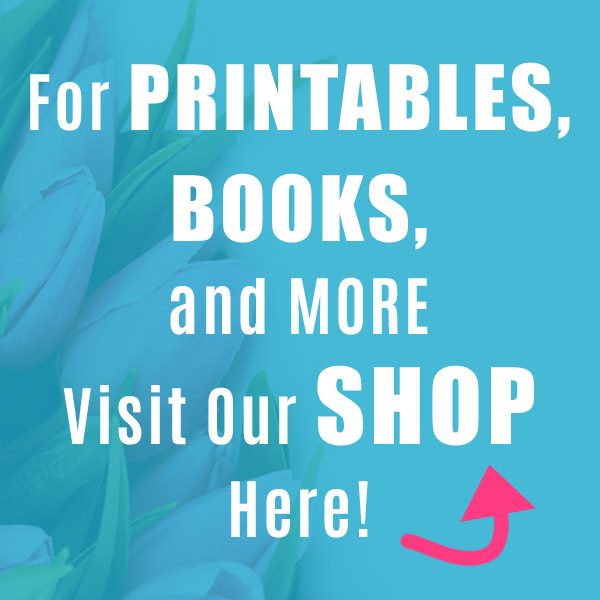 You could follow a color theme, or use all glass ornaments, all solid-colored ornaments, a mix of glass and plastic or soft ornaments, the list goes on and on! 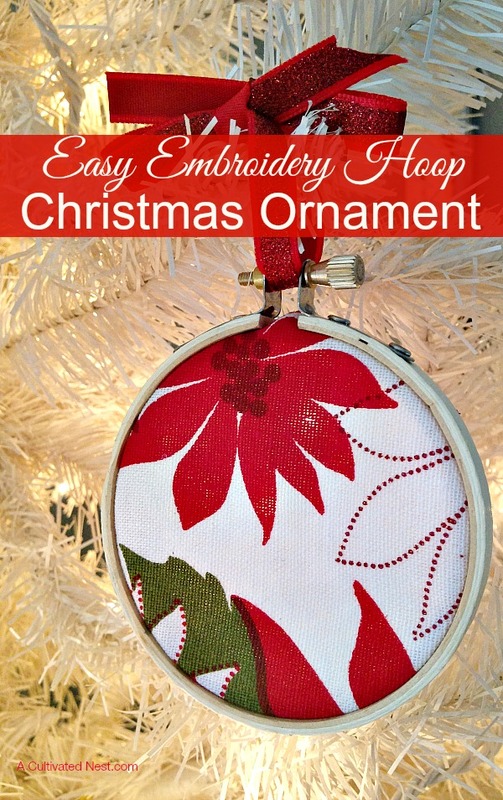 I personally like to do a mix of ornaments, incorporating both store-bought ornaments and handmade ones. The handmade ornaments often wind up becoming my favorite, because not only are they pretty or cute, but they carry wonderful memories! 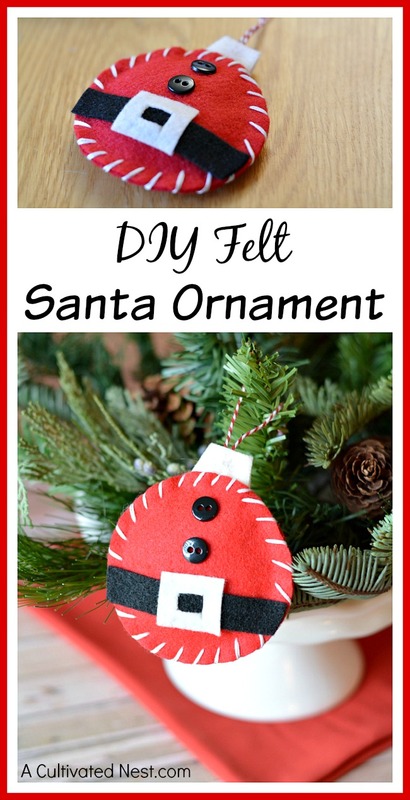 If you’re looking for a cute ornament to make for your Christmas tree, you have to make this DIY Felt Santa Ornament contributed by Kari! 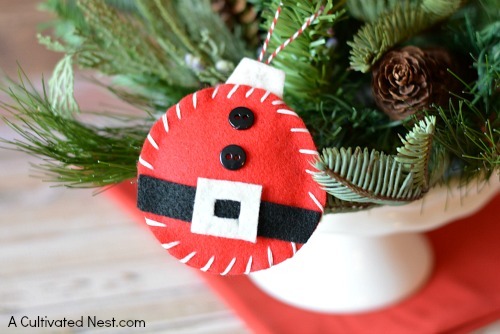 This felt ornament craft is inexpensive, easy, and fun! And if you didn’t feel like sewing, you could just use hot glue or fabric glue for everything, instead. This would be a great activity to do with kids! 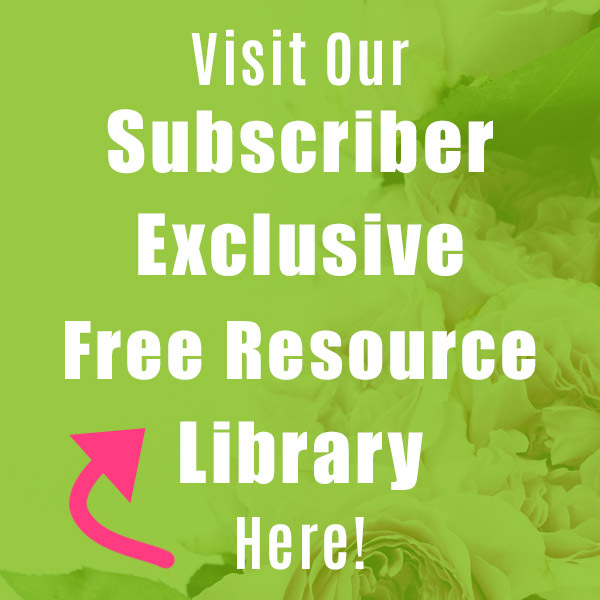 If you don’t have experience with the overcast hand stitching method, there’s a helpful sewing guide available on Sew 4 Home. 1. 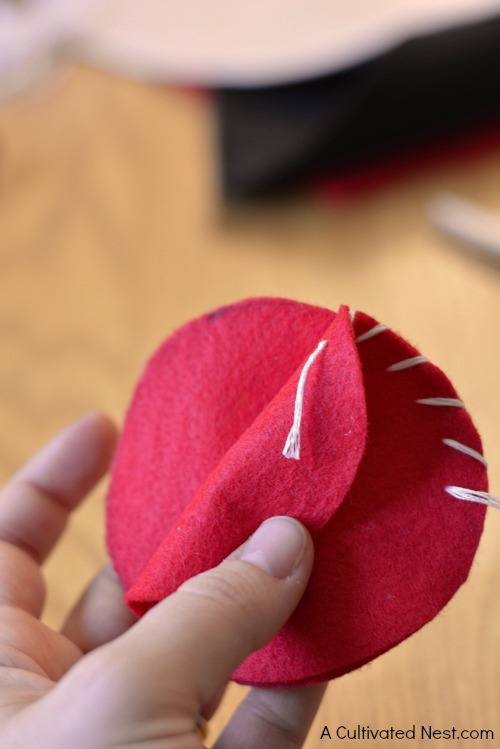 Fold the red felt in half. Then use a pencil and circle template to trace a circle. Cut the felt apart, two pieces at one time. Flip the circles (if necessary) so the pencil outline is on the inside. 2. With black felt, cut a belt. 3. 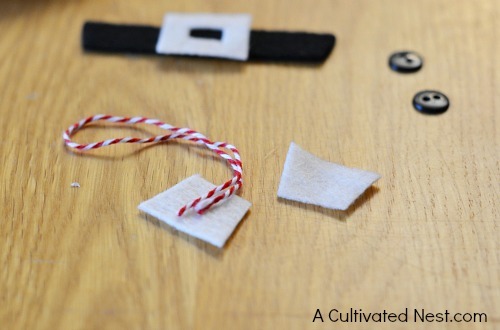 With white felt, cut two pieces for the ornament top and one square buckle. 4. Cut a small piece of thread/string for hanging. 5. Position belt, buckle, ornament top and two buttons onto your red felt to be sure you like the position and placement. 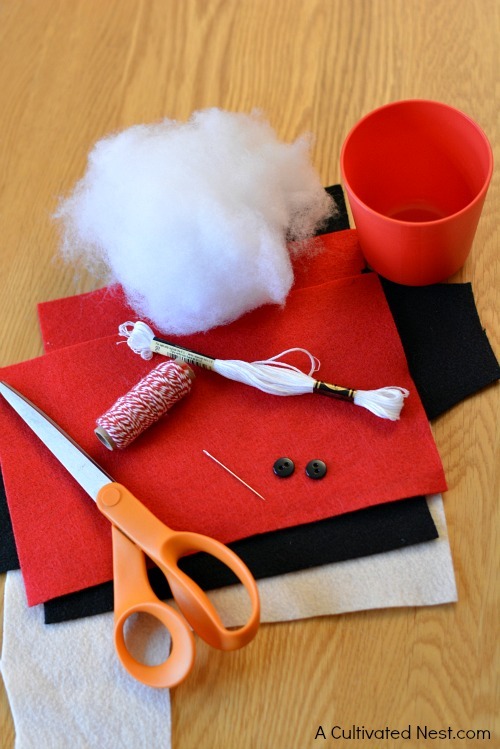 Then remove pieces to begin sewing red felt. 6. Cut a piece of embroidery floss about 45″ long. Separate it in half, so you are sewing with three strands. Thread the needle and fold in half, tying a knot at the end. This will allow you to sew with six pieces of embroidery floss for a nice crisp, bold look. 7. 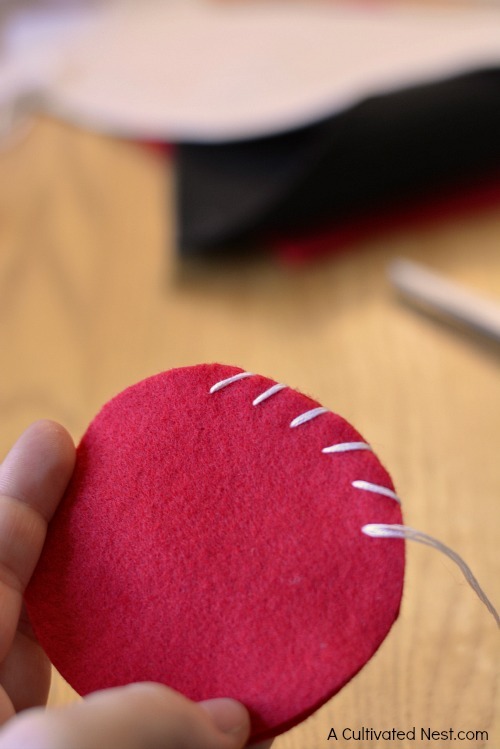 Begin to stitch the two pieces of felt together using the overcast stitching method. When you are almost complete, stop to fill with fiberfill. 8. 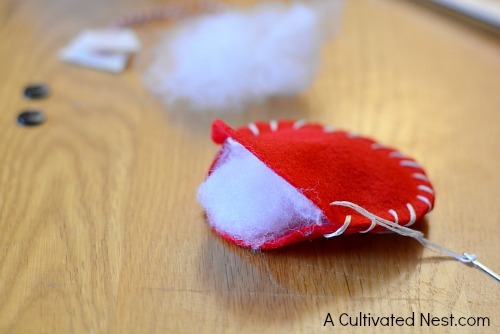 Place the “ornament top” felt pieces on a flat surface and glue the hanging string between the two pieces. 9. 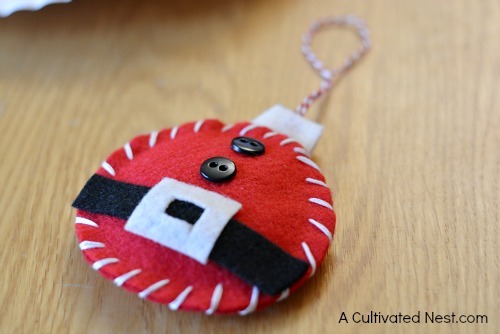 Slip the ornament top felt into the red ball and continue your stitching to attach the top. 10. 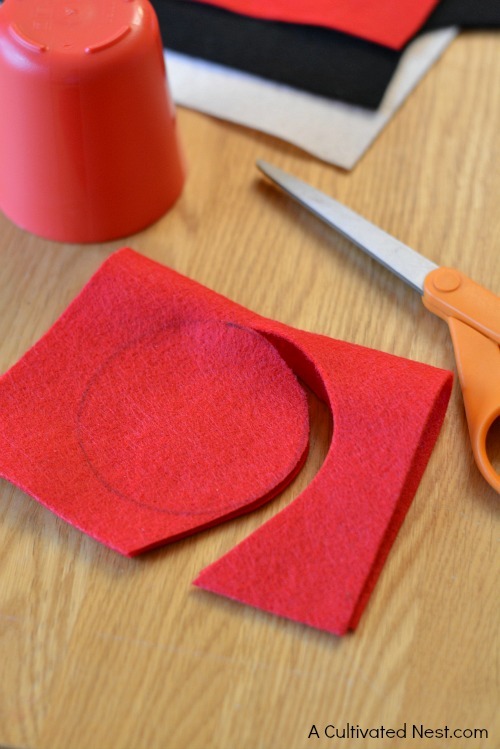 Using a hot glue gun, attach the buttons, beltm and buckle to the red felt front. Kari is a Mom, Wife, Dog Lover, Graphic Designer, Chocolate Lover, Fearless Baker and a regular contributor to A Cultivated Nest. Oh my goodness! This is so cute!! I have everything that I need to make a few for my own tree. Now that I’ve seen this, it’s on my crafting list for today. If you have time to stop by “Best of the Weekend” to add this ornament to the party, I know that my readers would enjoy seeing it. So cute! My kids would love these. 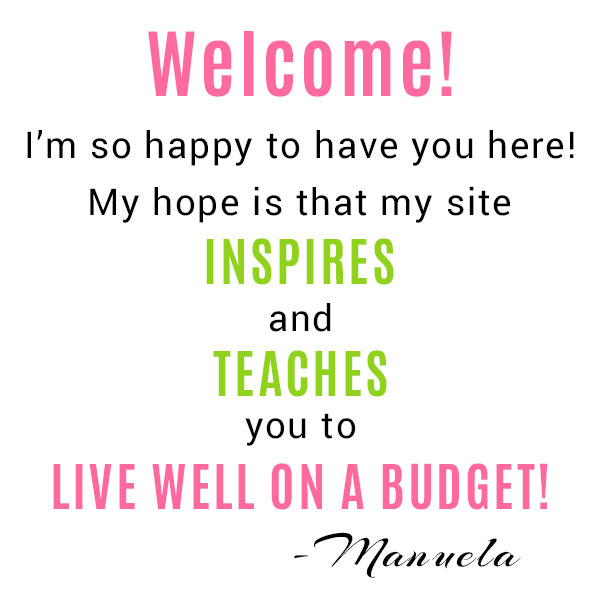 Thanks so much for linking up to our first Inspired By You link party! We hope to see you there every Sunday! Hi Manuela! I just wanted to let you know that I LOVE your Felt Santa Ornament, and I’m featuring you as my pick for the Rockstars this week from Creativity Unleashed! As a Rockstar you’re in the running for this week’s MEGA Rockstar! Grab your friends and come vote at http://www.theboldabode.com/creativity-unleashed-week-98.html The MEGA Rockstar gets loads of love including: 1. 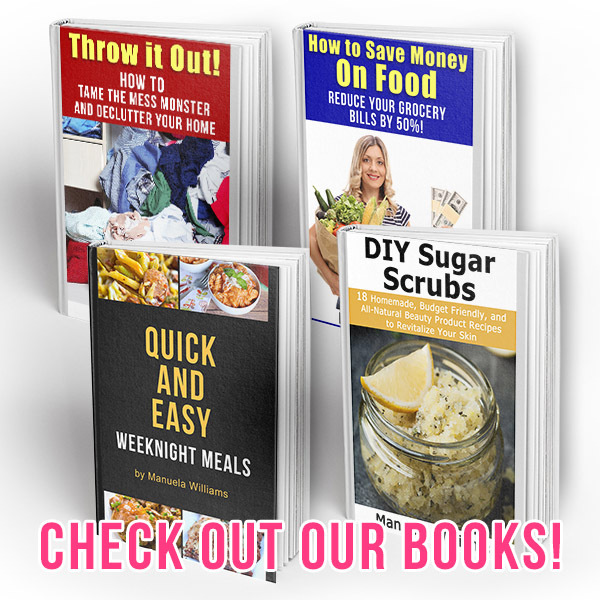 The Mega Rockstar project will be featured on all of our social media networks (that’s FB, Twitter, Pinterest, and G+ shoutouts from five different bloggers!!!) 2. Each host will visit the Mega Rockstar’s blog that week and we’ll pin a bucketload of any other great content we find to some of our largest group boards! 3.The Mega Rockstar of the week will get an invite to our secret group Pinterest board where you can pin your own great content. We go through that board each week when we are looking for great, new content to pin, so this means that even months after you’ve won the Mega Rockstar of the week, we can still find and pin your newest awesome content! Congratulations and Good Luck!! !